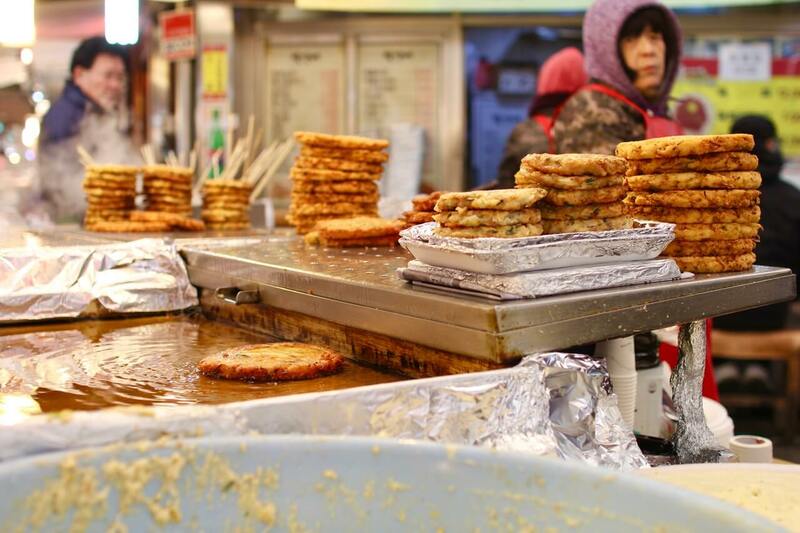 This mung bean pancake is very popular at Gwangjang Market and you’ll see a number of vendors shallow frying these golden pancakes. Scoops of ground mung bean mixed with vegetables is ladled into pans of hot oil and fried until crispy. Dip your pieces of bindae-tteok into the vinegar and soy sauce mixture that accompanies it and top it with some crunchy white onion. The perfect snack! 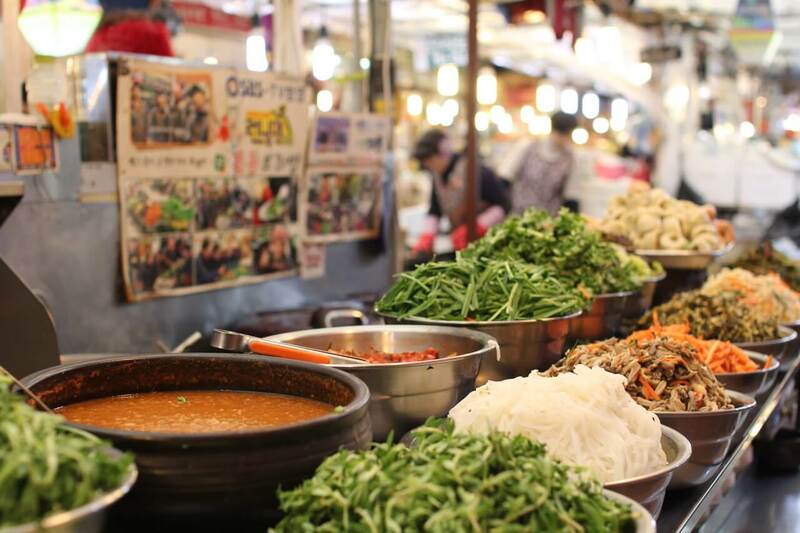 The vendors at Gwangjang Market are well known for selling ‘Mayak Gimbap’ which translates to ‘narcotic rice rolls’. It’s not a literal translation, these seaweed rice rolls don’t actually contain narcotics but they’re so named because they’re super addictive! Pickled vegetables like carrot and burdock root together with perilla leaves are rolled together with rice and dried seaweed. They’re then brushed with sesame oil and then sprinkled with toasted sesame seeds. 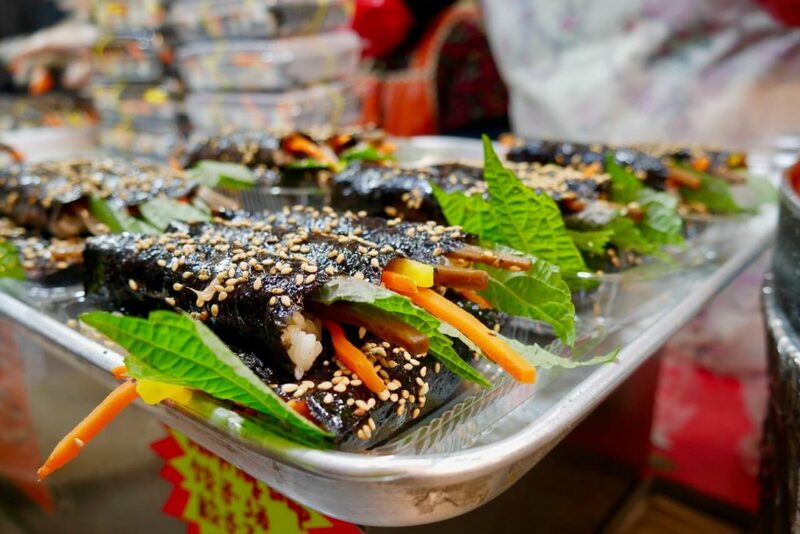 The sesame oil gives the gimbap a nutty aroma and the pickled vegetables are tangy and crunchy. Enjoy the gimbap with a swipe of the watery wasabi sauce that accompanies them. Bibimbap is a must eat at Gwangjang Market. Giant bowls of fresh vegetables and kimchi line the benches of the bibimbap vendors. Bibimbap is mixed rice so rice, sometimes barley and a load of fresh and pickled vegetables is mixed together before eaten. A dollop of gochujang (red chilli pepper paste) adds a mellow fiery kick to the bowl. You can choose between a cold bibimbap or one served in a dolsot or hot stone bowl. If eating dolsot bibimbap leave a bit of rice on the bottom of the bowl to let it crisp up from the heat of the dolsot. Delicious! 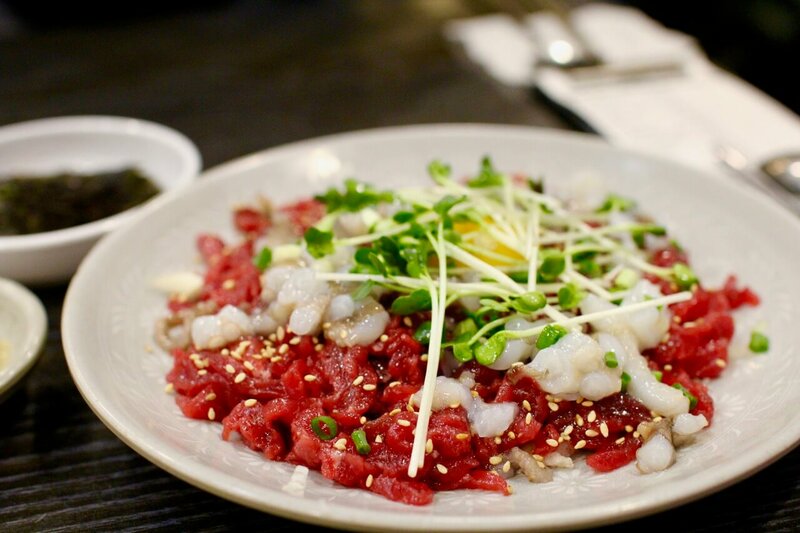 Located near the street food vendors is Raw Beef Alley another must visit when at Gwangjang Market. Buchon Yukhoe is a good choice- it’s Michelin recommended (Bib Gourmand 2018 Seoul) and the beef is brought in fresh each morning for service (watch the video and check the description for more detail). The steak tartare served with matchstick pears, sprouts, raw egg yolk, sesame oil and sannakji (raw baby octopus) is not only tasty but a vision- the bright red of the beef contrasts beautifully with the white of the octopus and the green of the sprouts. The beef is fresh, tender and complemented by the sweet pears and aromatic sesame oil. 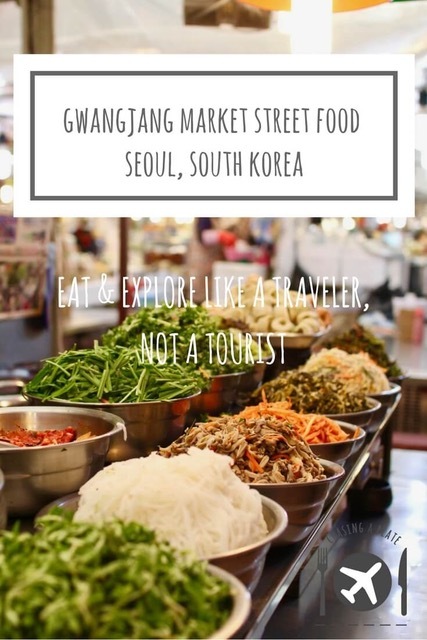 We hope this South Korea food guide has helped you eat and explore like a traveller, not a tourist! Watch our South Korea videos below. Subscribe to our YouTube channel for new videos every week!